Global climate change – rapid, substantial and human induced – may have radical consequences for life on earth. The problem is a complex one, however, demanding a multi-disciplinary approach. A simple cost-benefit analysis cannot capture the essentials, nor can the issue be reduced to an emissions reduction game, as the Kyoto process tries to do. It is much more sensible to adopt an integrative approach, which reveals that global climate change needs to be considered as a spider in a web, a triggering factor for a range of other, related problems – land use changes, water supply and demand, food supply, energy supply, human health, air pollution, etc. But an approach like this, which takes account of all items of knowledge, known and uncertain, does not produce clear-cut, final and popular answers. It does provide useful insights, however, which will allow comprehensive and effective long-term climate strategies to be put into effect. 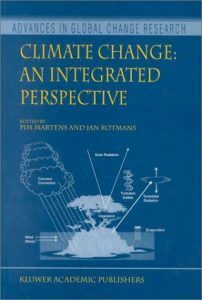 Climate Change: An Integrated Perspective will appeal to a broad spectrum of readers. It is a useful source for the climate-change professionals, such as policy makers and analysts, natural and social scientists. It is also suitable for educationalists, students and indeed anyone interested in the fascinating world of multidisciplinary research underlying our approach to this global change issue.